Today is Home Decor with Christmas with the Cricut. I had so much fun making this advent calendar. I remember as a kid getting so excited about Christmas, and fighting with my brother and sister on who's turn it was to open the little doors on our advent calendar. There was so much I wanted to show you with this project, that I had to make a video. Head on over to Teri's blog to see what she's done for home decor. She is amazing! 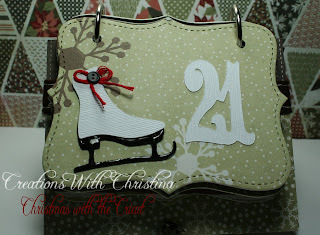 thanks for showing your great advent calendar, christina! Beautiful way in showing an Advent Calendar. It looks like a lot of time spent in making...maybe if I start now I would have finished by December 1st to start using. Great idea!! Love all the work you do. This is such a clever idea. I really love it. And, as always, you've done a fabulous job on it. thanks for always being willing to share! Wow! Your calendar is beautiful! Thanks for sharing your talent. Love it! This project is so pretty! You did such a fantastic job on it! I love this, thanks again. This is so beautiful! One of my favorite Christmas home decor items so far! Wonderful job! I just love it!! Its so cute and what a great idea!! I just have a quick question for you though....Where did you get the ultra thick embossing powder and how do you only get it on the areas you want? I know when stamping you your stamp and the pad, but how do you do it on cut images? Do you just use the Versamarker? Thanks!! Thats a great idea. Thanks so much. Keep up the great job. This advent book is adorable! Can't wait to make one for my kiddos! This is my favorite project you've done since I started watching your videos. All of the details are awesome and I love the EP!!! Christina, you know I love all of your projects but WOW! This is just fantastic!! Love everything about it. Christina- absolutely stunning!!! I can't wait to try this. ps I started making my cards from the wild cards cart. Thanks for the inspirations... they've been turning out great and are so much fun to embellish. Christina - this is a great idea thank you for sharing your talents with all of us. What an adorable advent calendar. My great nephew would love one of those for Christmas. I think I will do it so that it is a countdown kind of calendar. I will start it at 24 and count down to 1. Your pages are just so pretty. Another great project, love it! Thanks for sharing. Ooiieee! I love advent calendars and this one is just plain adorable! Thx for joining us... We feel so blessed to have you on our team and this project is one of the reasons why!! Christina, This advent book is sooo cute. You did a great job.Thanks!! Hi Christina! Love the advent book! It is so cute!!! I've never played w/ chipboard before. do you just glue down the paper on it? Is that how you covered the pages? If you could email me how you made one of the pages I'd appreciate it! Now that is adorable!!! I love this idea! Great job, and I think I need some Utee!!! Very cute. I will have to make one for myself but my boys would kill me if I didn't get a calendar that opened up with candy inside. This advent calender is so creative and cute and the video is awesome! Thanks for a great project! I love it! That's fabulous!! Great project!!! I love all the added details. Can't wait to see your next video. I love, love, love this. Great job. Thanks for Sharing. 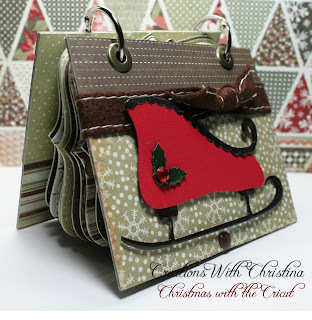 Where did you get the ultra thick embossing powder and how do you only get it on the areas you want? Do you have a video using it? I found UTEE at AcMoore. I think Michael's has it as well. You use it just like embossing powder with a VersaMark pad. It's great. Thank you so much!! Your Advent Calendar is FANTASTIC! I love everything about it! You could use the idea for a photo album, recipe book, etc! Thank you so much for sharing your creativity and talent with all of us! Wow, this is so cute! I am afraid to show mine now for next week! Just darling! I love how you used the UTEE, makes the embellishments look like glass. Fantastic way to do an advent calendar...thanks for the inspiration. Wow, Christina, Your project is beautiful~ I LOVE IT!!! Great job! Great project, Christina! You are busy. Thanks so much for sharing your creativity! Awesome job! thankss for sharing! Christina~this is my 1st time to your site and might I say "wow", that's really pretty. Nice work. I love your Advent Calendar! The detail that you added with the UTE was awesome. I may try this now, seeing how well it turned out in your project. OH well, another trip to the Craft Store! Always enjoy your videos, Christina! This project was simply beautiful! TFS! What a great idea and a how perfect is the WW cartridge for your embellies. I just ♥ every page! TFS! Christina, I love it. I was looking for something differnt to make and this was it. I posted mine on the Cricut Message board. Teri - If you're talking about the pink tool that sets the eyelets it's the Crop-A-Dile. WONDERFUL tool that you can find at any craft store.